"A great book that I wouldn't hesitate to recommend to anyone. On a scale of one to five I would give this book a six because it's just that good." "I think this is a wonderful book. The reading level is listed as ages 9-12, this book is perfect for that age group. As the mother of a 10 year old, it can be difficult finding books that capture his attention. Nate Rocks! is such a book. He read it in a day. I knew it was a winner when I heard laughter throughout his reading. When finished, he looked up and said "Is there a second book?" Ms Toz was able to easily capture the mind and imagination of a 10 year old boy, both Nate and my son. I look forward to more of her books." "I love the way the author seamlessly blends Nate's real life and his fantasies of heroism and excitement. Middle grade readers, especially on the younger end, will easily relate to the loose boundaries between real life and fantasy, and will also instantly relate to the real trials and tribulations Nate faces with his family and friends. I can easily recommend this book for both boys and girls in third through fifth grade. I'm glad to have had a chance to read it." "A fun book for anyone from 4th Grade on up! Toz really captures the heart and mind of a 4th grade boy and I can relate to his daydreaming and cartooning. 5 out of 5 stars." 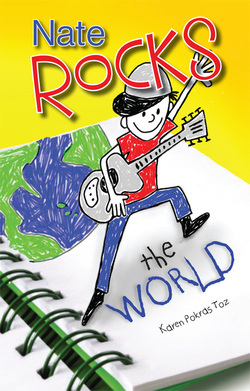 "Nate Rocks the World by Karen Pokras Toz has everything you could ask of a children’s chapter book: adventure, fun characters, and a put-upon protagonist we can all relate to. The author does a splendid job of involving us with the story and making us care about the characters." "Karen Pokras Toz has the unique knack of bringing to life the questions, fears, and dreams that many a young boy has swirling in their minds on any given day, making for a hilarious and relatable quest by Nate." "Nathan Rockledge is in the fourth grade. He likes books more than kickball, eating out more than eating his mother’s cooking at home, and drawing more than anything else. He lives for the next holiday and would like to skip his big sister’s next phase. Most of all, Nate wants to rock the world as a hero who saves the day. Karen Pokras Toz’s telling of Nate’s story will make you hope that Nate’s dream to become a hero will come true. Readers will see the world through Nate’s eyes and will grow to like him as much as I do." "Nate Rocks the World is a children's book. I'm unashamed to say that I enjoyed it, and even giggled - out loud. This is a brilliant book, and I can guarantee that every little kid out there will love this book! I give this a 5/5 and recommend it for kids and parents, and big kids out there!" "Nate Rocks the World was a fantastic book! It was a very exciting read that had me captivated by what Nate would be up to next. Like most children Nate’s imagination got the best of him when he was bored. His imagination would take him to outer space, the North Pole, Rock Stadiums and more. This book clearly encourages imagination. This book would keep any young reader turning the pages." "Nate Rockledge isn't your typical ten-year-old. Even when life throws him curve balls (or kick balls as the case may be) he knows exactly how to have a good time. His imagination takes him from hitting the winning home run, to the wild west, to the reaches of space. Your kids will love riding along with Nate as he jumps from one adventure to the next. They'll enjoy every minute of it, because quite simply, Nate Rocks!" "Nate Rocks the World seems to have the two things young boys like most: humor and adventure. The book captures a lot of problems that loom for elementary school kids: siblings, the principal’s office, girls, hiding your fears from the other guys(and gals). Reading this book with their child could be a good way for parents to begin a conversation about all kinds of things. Then, after a dose of reality, Nate ricochets off into fantasy world with adventure after adventure. The daydreams are so varied it’s hard to believe that any reader can finish the entire book and not find an adventure that is their secret dream....The dialogue of the young characters is spot on…I think young readers will believe it’s really the words of a Fourth Grader not a mom pretending to be a Fourth Grader. The shift from reality to fantasy and back divides the book up into short sections making it easy for new independent readers to manage." "I would recommend this book for ages 7 to 12, or anyone with a crazy imagination. It’s a great book for those reluctant boy readers; it will keep their attention from the beginning to the end. Every chapter is packed with action and fun. Nate Rocks deals with problems and issues that almost every kid can relate to. I enthusiastically give this book 5 stars! I have to confess, I read it in two sittings. I couldn’t put it down. I would have read it in one sitting if I didn’t have those pesky things like work and mommy duties to take care of. It was definitely laugh out loud funny. Karen has a way with kid humor and vivid descriptions." "This book is full of humor and sparked memories from my own childhood. It’s light hearted and a really enjoyable book to read if you’re an adult and a fun book to have read to you if you’re still a child." "This book is a fun, family-friendly story that parents could read with their kids. It’s guaranteed to spark the imagination of the young and old(er.) Its feel good ending makes us hope that we can rejoin Nate and his family again soon for a second installment, because Nate does in fact ROCK!" "Nate Rocks the World is a great book for any boy (or girl) in the 7 to 14 age range, in my opinion. I look forward to reading more by Karen Pokras Toz!" "I think Nate Rocks the World is one of the best books I've ever read. I like how he draws comics like I do. My favorite part of the book is when he captured the robbers. You should read Nate Rocks the World. It is a great book for any kid." "Karen Pokras Toz does a fantastic job with this one and it hits right at the interest of the intended age group. There is so much humor in this book from the circumstances of Nate's life that it is hard not to laugh out loud at the relationships he has with his sister, mother and father. Karen taps right into the mind, imagination and thoughts of a ten-year-old boy and it makes for a hilarious story. I can see this being a definite pick-up off of my classroom shelves, particularly from those boys that don't like to read...Great book, moms and teachers be sure to add this to your child/students to-read list!" "This is a fascinating and fun story that middle grade boys are going to love. Toz definitely has a finger on the pulse of this market. She knows what’s exciting to them and uses it to create a page-turner that will leave them wanting more." "I’m pretty sure anyone who reads this will want to climb into the book and give Nate a big pinch right on his little freckled cheeks. As a middle school teacher, I know all kids can relate to Nate, and kids will quickly want to join Nate and his alter ego, Nate Rocks. Nate Rocks the World has a light and easy tone to it, and the readability is probably best suited for kids aged anywhere from 7 to 12-in general." "I would give Nate Rocks The World a five out of five stars for its imaginative creativity and how one could almost imagine it on the big screen, right down to which children could play the roles involved. Author Karen Pokras Toz has written a great book that is guaranteed to keep your young reader enthralled right to the very end". 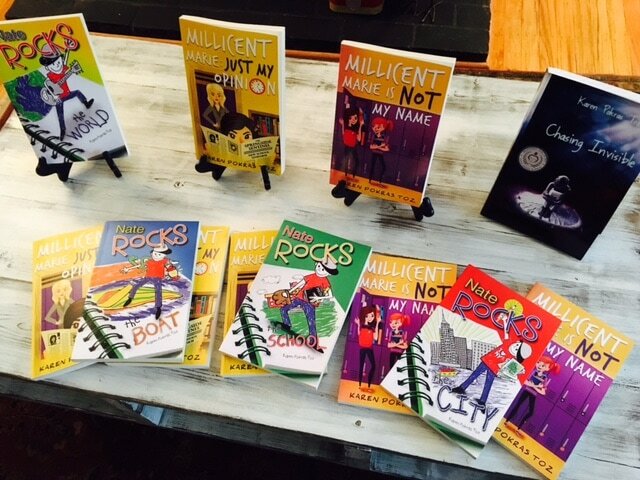 "After reviewing dozens of books geared towards 8-10 year old boys, I have to say that Nate Rocks the World rates high in enjoyability for this age group. It is hard to find a well-written boys' book that will keep their attention, but Karen Toz does a wonderful job... This is a wonderful page-turner, that will keep your young man engaged during the entire reading. Who knows, it might become one of his favorite books to read!"